The use of ecstasy and LSD among young adults has spiked over the past two years, with survey results indicating the numbers taking the drugs in the past 12 months up 84% and 175% respectively. An estimated 157,000 more people aged 16-24 took ecstasy over the past year compared to two years ago, according to figures released on Thursday. About 49,000 more used the hallucinogen LSD over the same period. An estimated one in 20 young people have used ecstasy in the past 12 months, according to the latest data. Use of LSD is still much lower, with around 0.4% of young people – about one in 200 – using it. Both drugs saw year-on-year increases in consumption by the young of around 40%. The figures will be a serious blow to the government’s hardline strategy on drug use. In an effort to combat an increase in the numbers of new designer drugs, a recent bill was introduced that would ban all new psychoactive substances. 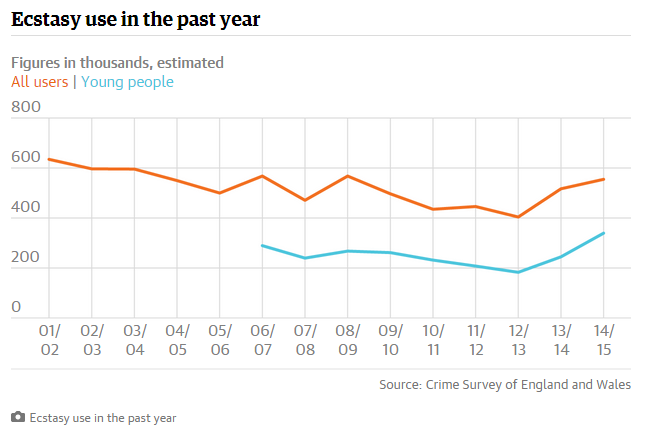 But even as overall drug use remained flat, the statistics from the Crime Survey of England and Wales show a sharp rise in the use of the two class-A drugs, which are among the drug war’s major targets. Among most of the population – those aged 16-59 – use of ecstasy in the past year has risen an estimated 37% since 2012/13, while use of LSD is up 117%. The reasons for the surge in the popularity of LSD are unclear, but one expert said the rise in ecstasy use could be explained by an increase in the availability of relatively pure MDMA – that drug’s active ingredient. 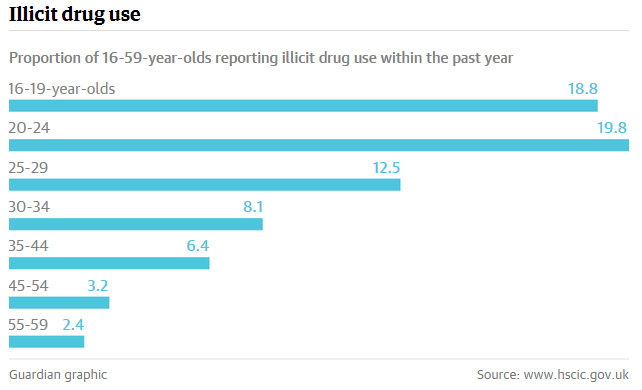 The figures also illustrate how young adults remain the most likely age group to take drugs: they indicated 19% of 16-19 year-olds and 20% of 20-24 year-olds took any drug within the past year. By contrast, only 2% of 55 to 59 year-olds did so. The survey found that use of new psychoactive substances (NPSs), more commonly referred to as legal highs, was generally concentrated among young adults. Around 3% of 16-24 year-olds took an NPS within the past year, compared with 1% of 16-59 year-olds. Those young adults who took NPSs were most likely to acquire them over the counter. An estimated 39% bought them from a shop, while 37% got them from a friend, neighbour or colleague. Only 1% of young people reported using the internet to buy NPSs. The survey results also appears to indicate a rise in the number of people mixing different drugs. Of those people who took drugs within the past year, 9% reported having used more than one drug at once, compared to a previous figure of 7%. The drugs most likely to be mixed with other drugs were mephedrone (68%), ecstasy (57%), amphetamines (50%) and tranquilisers (35%). Professor Fiona Measham, who chairs a working group on polysubstance use for the Advisory Council on the Misuse of Drugs, said that the increase in the number of 16-24-year-olds using ecstasy from 3.9% to 5.4% represented an important development. “My view is that increased purity from 2010 onwards across Europe is making ecstasy in pill, powder and crystal form increasingly attractive, combined with easy availability and relatively low prices,” she said. Separately, figures released by the Health and Social Care Information Centre show that the numbers of young people aged 11 to 15 who have ever tried smoking, drinking or drugs are at their lowest levels since 1982. More than 6,000 pupils in 210 schools in England were asked a series of questions about smoking, drinking and drug use. Just 18% said that they had ever smoked, the lowest figure since the survey began. The proportion of 11- to 15-year-olds who said they had tried e-cigarettes was slightly higher at 22%. The results are consistent with a continuing decline in the number of children trying tobacco over the past decade. In 2003, 42% said they had tried smoking. Meanwhile, 38% of 11-15 year-olds reported having tried alcohol, also the lowest level recorded since the survey began. In 2003 the figure was 61%. 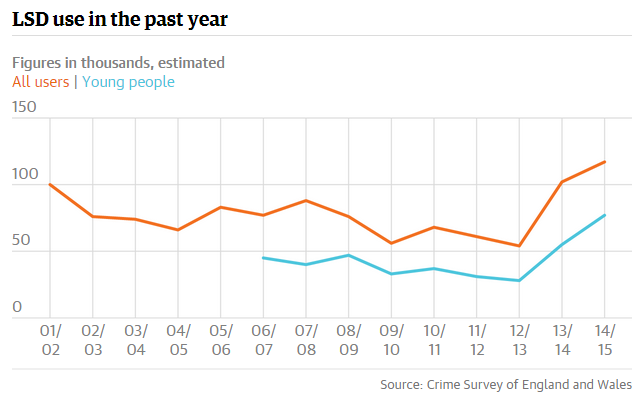 The number of 11-15 year-olds who reported having ever tried drugs also hit a new low of 15%, down from 30% in 2003. Cannabis remains the drug most likely to be sampled by young people: of the 10% of pupils who said that they had tried drugs within the past year, 7% reported trying cannabis. The survey also sheds light on young people’s attitudes towards why other young people their own age decided to smoke or drink. The most common reason, at 85% for smoking and 79% for drinking, was “to look cool in front of their friends”. But there was a variety of other motivations: 72% of young people said they thought their peers smoked because “their friends pressure them into it”, while 70% thought it was because they were addicted to cigarettes. A smaller group, 67%, thought their friends drank in order to be more sociable, and 66% said they thought they drank for a rush or a buzz. 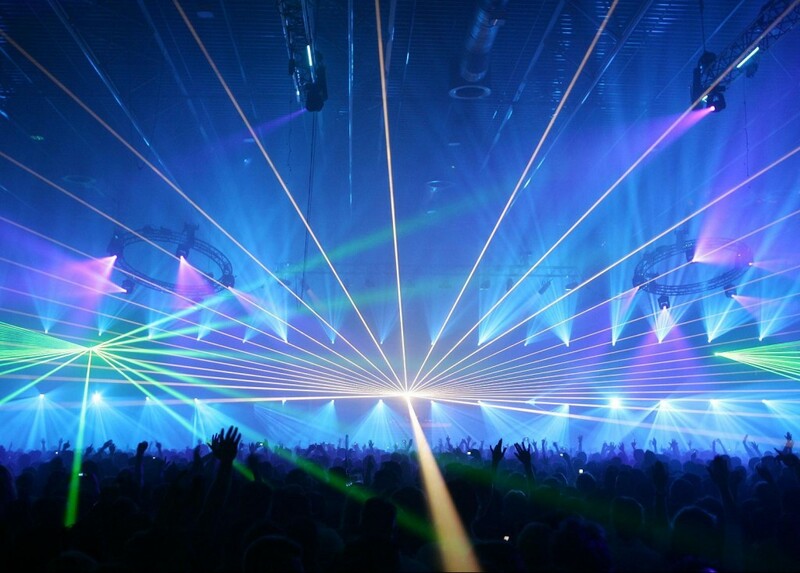 Measham, who is professor of criminology at Durham University, said the popularity of ecstasy, which has long been associated with rave culture, dipped when fashions changed in the 2000s and people moved onto alcohol and cocaine. The rise in LSD use was more difficult to explain. “It was popular in the mid-90s when it got down to about 50p a tab,” Measham said. “So I think the risk-to-reward ratio for dealers was not there.” Although there were no sentencing guidelines, at the time dealers could expect to get about a month in jail for each tab of LSD in their possession, she said. She said relative scarcity of the drug could also be a factor, with some users shunning substances they feel have become too popular and too accessible because they are no longer cool. “Maybe there’s a whole load of stars aligning in relation to that,” she added. Amanda Feilding, director of the Beckley Foundation, which researches psychedelic drugs, said she had heard anecdotal reports that more people were using LSD. “I think there’s more around now,” she said. “There was a kind of great shortage and now I think more people have got into it. The policing minister, Mike Penning said: “There are positive signs our approach to drugs is working as there has been a long-term downward trend in drug use over the last decade. This article was originally written by Damien Gayle and David Pegg for The Guardian. "General News" pieces are not written by Law Enforcement Action Partnership (LEAP) UK but by external journalists and organisations. We recycle our favourite articles as found across the internet to keep our users in the loop with the latest developments in drug policy. We do our best to ensure that all articles are properly referenced to the original authors. Please contact us here if you feel we have failed on this occasion to identify the original creators of this content. 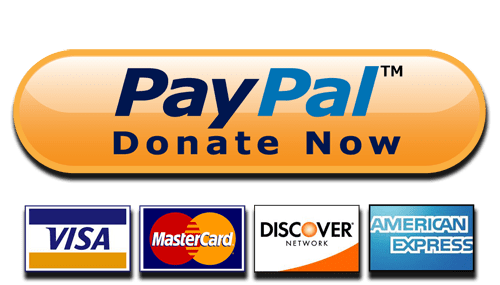 Copyright © 2019 Law Enforcement Action Partnership UK.